Cycling race “Route the fights, Major Hubal” has a long-standing tradition. It was first held in 2000. His was conceived, the silver medalist of the Olympic Games in Seoul – Andrzej Sypytkowski. The race was organized in the formula of a one-day race on a route around Końskich, who led the county roads Konecki, where he still lives legend Dobrzański Major Henryk “Hubal”. It is surrounded by forests and roads konecczyzny paced the autumn of 1939. Branch separated WP commanded by Major “Hubal” rolling unequal struggle against the Nazi invaders. The memory of these events is an integral part of the race and is still living history lesson, especially for the young generation of Poles. The ninth edition of the race “Route the fights, Major Hubal” was held on 21-24. 08. 2008. And it was the second time in the history of the race multi-stage event entered into the calendar of international cycling races UCI kat.2.2. It was attended by the best Polish riders and teams abroad. A total of 88 riders took off, who had a route length of 527 kilometers divided into four stages and a prologue. The winner of the first stage, the finish was in Szydlowiec was Wojciech Pawlak (Mróz Action Uniqa). On the second stage with the finish line in Kazimierza United won Tomasz Kiendyś (CCC Polsat Polkowice), while in the evening the stage around Jędrzejów triumphed Krzysztof Jeżowski of CCC Polsat Polkowice. The last stage IV played on the traditional route around Końskich and the winner was Adam Wadecki of the Estonian team Kalev. In the general classification of the race’s best player was Tomasz Kiendyś (CCC Polsat Polkowice) and the third time was the winner of the race “Route the fights, Major Hubal”. For the first time since the beginning of playing the race “Route the fights, Major Hubal” the organizers decided to move away from formula one-day race and organized on 23-26.08.2007 r. 3-stage race preceded by a prologue. In the peloton there were 87 riders representing leading Polish professional groups and four foreign teams from Lithuania, Latvia, Belarus and Finland. Competition riders started with the prologue in Radom, staged today in the form of time trials. The next day, the riders set off on the route of the race counting three stages with a total length of 484 km. The start and finish of the first stage was located in Szydlowiec and the winner of this stage was Mateusz Komar (DHL Author). The next day, the riders competed in Końskich beating traditional four 45-kilometer round. The victory in the second stage won player of CCC Polsat Polkowice – Krzysztof Jeżowski. The last element of the VIII edition of the race “Following the fighting, Major Hubal” was the stage around Włoszczowy. The quickest at this stage was a team player DHL Author – Daniel Czajkowski. 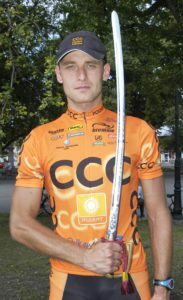 In the overall race victory was rider of CCC Polsat Polkowice – Tomasz Kiendyś and a second time received the prize for victory – a replica of the sword Major “Hubal”. The seventh edition of the race “Route the fights, Major Hubal” was held on 26.08.2006. And traditionally gathered for the loss of players of all Polish professional teams: Intel Action, CCCPolsat, Knauf, DHL Author, Legia Bazyliszek, MBK Paged Scout, Weltour and riders from Latvia and Belarus. The riders competed as in previous years, on the famous route around Końskich. 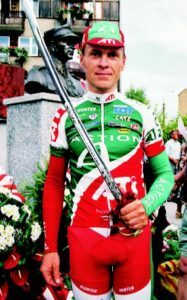 After defeating the four, 45-kilometer loop at the finish line in the fastest Końskich was a player of professional cycling teams Knauf – Tomasz Lisowicz and he accounted for the main prize of the race – a replica of a sword, “Hubal” that traditionally, from the beginning of playing the race handed p. Krystyna Dobrzańska- Sobierajska. In the cycling season 2006 race “Route the fights, Major Hubal” was entered in the racing calendar of the UCI Cat. 1.5 and also belonged to the elite cycle race the best in Poland – Proliga Arkus & Romet. 20 September 2005. For the sixth time at the start of the Końskich stood riders of all Polish professional cycling teams with Intel Action, Knauf, DHL Author, PSB Atlas Orbea, the Legia Bazyliszek, MBK Paged Scout and riders Mikomaxu and Weltouru. As in previous years, competitors had to overcome 180 kilometers of the route (4 rounds around Końskich), which is led by Gatniki, Sielpia, Miedzierza, Watchtower, Przyłogi, Modrzewina, Czarna, Wasosz Konecki the finish line in Konskie. Before the start of the race “Route the fights, Major Hubal”, riders and numerous community gathered Końskich took part in a ceremony commemorating the 65th anniversary of the death of Major. Delegation players made a bunch of flowers and lit candles at the obelisk “Hubal” exposed during the fifth edition of the race. 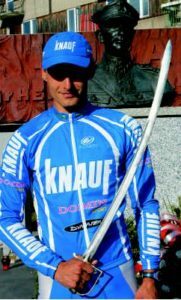 The winner of sportsmanship was a player of professional cycling teams Knauf – Tomasz Kiendyś. The prize for the victory, a replica of the sword Ułańska “Hubal” handed p. Krystyna Dobrzańska-Sobierajska. The sixth edition of the race also had its own particular dimension of sports, because in 2005 the race was qualified and entered the elite cycle race “Pro League Polsat Sport”. It is a great honor for the organizers of the race “Route the fights, Major Hubal,” the more that the Końskich was a summary of the competition cycle and awards. Pro League winner in 2005, was runner team DHL Author – Radoslaw Romanik and he received the prize for victory. Awarding the prize, the Golden Bike Shimano, made President Ryszard Pawlak and Czeslaw Lang. The fifth edition of the race was unique. The organizers of the race from the very beginning of the idea behind the connection sport rivalry with the traditions of the Polish army, which the district Konecki in a special way embodies the character of Major Henryk Dobrzański “Hubal”. His faith in victory and fight to the end is also the man and the athlete. Reminder young generations of Poles about the achievements of “Hubal” is a patriotic duty to the idea of which was included in the formula of the race. The winner of the race receives, amongst others, replica saber Major “Hubal”, a route on which riders compete goes by where branch H. Dobrzańskiego in 1939-1940 led an unequal battle with the Germans. The uniqueness of the fifth edition of the race consisted also in the fact that on the first day of the race, 21,08.2004 r. On the initiative of the city and county Konecki, was unveiled a monument to Major Henry Dobrzański “Hubal”, which is a tribute to all the heroes of World War II, who fought for an independent Poland. 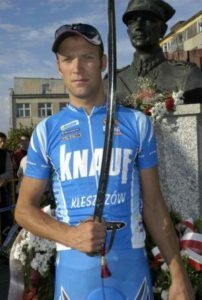 In competitive sports, after a very exciting fight, the winner of the race was a player of professional cycling teams Actio ATI – Kazimierz Stafiej and that he received at the hands of the daughter of Major “Hubal”, p. Krystyna Dobrzań–Sobierajska main prize of the race – a replica of the sword “Hubal”. The fourth edition of the race “Route the fights, Major Hubal” was played 23.08. 2003 and was attended by riders of all Polish professional teams: CCCPolsat, Action nVidia-Mróz, Servisco-Koop, Legia basilisk, Mikomax Browar Staropolski, Ambra Weltour and riders from the Czech Republic, Slovakia, Ukraine and Belarus. As every year, the riders overcame the same route four laps around Końskich a total length of 172 km. As every year, the patronage of the race became President of the Republic, which during the fourth edition was represented by the Secretary of State in the Office of the President, p. Dariusz Szymczycha. The guest of honor and the starter of the race was the daughter of Major Hubal, p. Krystyna Dobrzańska- Sobierajska, which every year honors the organizers and the riders with their presence and grandson – Henry Sobierajski. Also present were representatives of the sponsors of the race: among others, f-m HOOP (main sponsor of the race), the shopping center “Ptak”, Pątnów, publishing RYTM and representatives of the city and county Konecki with Mr RP, p. Adam Sosnowski. After a very exciting and fierce cycling competition, the winner of the fourth race of the cycling “Route the Fights Major Hubal” was played, the professional cycling team Ambra-Weltour – Marcin Gębka. 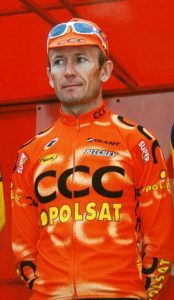 At the start of the third edition of the race being played on 01.09.2002 year, he stood the entire Polish lead the pack among professional team: Mróz, CCC Polsat, SNC, Legia and invited cycling teams from the Czech Republic, Slovakia and Belarus. Race gained a higher profile and was included in the calendar of international cycling events in obtaining UCI category 1.5. Once again the honorary patronage over the race became the President of the Polish Republic – Aleksander Kwasniewski and he founded the main prize of the race – a replica of the sword Ułańska Major Hubal. In sports competition riders as in previous years, they overcame route 172 km (4 laps) around Końskich fighting for victory in the third edition of the race. 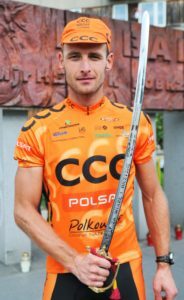 After exciting, cycling combat, first the finish line in Końskich drove player professional cycling team CCC Polsat – Radoslaw Romanik and became the winner of the third edition of the race. The big event of the race was held off tandems – cyclists blind guides, members of the association “CROSS”. Blind riders as professionals, competed on the same route around Końskich fighting for victory in the race. The sponsors of cycling holidays in Końskie were: District Office in Końskie, Ministry of Education, CROSS and companies: HOOP, Hator, Janlex and Publishing House RYTM. Another, the second edition of the race “Route the fights, Major Hubal” was played on 31.08.2001 year and had an international character of the event, because in addition to Polish cycling professional teams at a loss faced the team from Slovakia, Czech Republic and Belarus. To compete for the main prize of the race – a replica of the sword of Major Hubal joined 84 athletes Elite category. As in the previous year riders they overcame four loop around Końskich, where he first fought for the points classification of the mountain and the most active rider of the race. 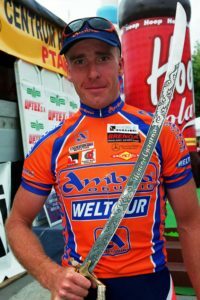 After fierce competition, the victory in the second edition of the race, won player of professional cycling teams CCCMat – Tomasz Kłoczko and he at the hands of the daughter of Major Hubal, p. Krystyna Dobrzań–Sobierajska received saber – the main prize of the race. Founder of the awards was the company HOOP, and the sponsors of the race was also the District Office and the company Janlex. The first cycling race “Route the fights, Major Hubal” organized Andrzej Sypytkowski with the strong involvement of the district office of the district administrator Końskich p. Adam Sosnowski at the helm. The honorary patronage over the race became the President of the Polish Republic – Aleksander Kwasniewski, and the organizing committee included many personalities of political and social, among others, Chairman of OPZZ – Joseph Wiaderny, former Prime Minister – Waldemar Pawlak, President of Telewizja Polsat – Solorz-Zak, Chairman of the Supervisory Board of TVP – Witold Knychalski and Vice-President of the UCI – Czeslaw Lang. The guest of honor at the same time starter of the race was the daughter of Major Henryk Dobrzański “Hubal” – p. Krystyna Dobrzańska-Sobierajska. At the start of the race, which was played on 09/16/2000 year he stood all the most Polish of the pack with the pros of Mróz, Matt Ceresit CCC, Atlas, Servisco and the Legia. The cyclists had a route 172 km, which led the county roads Konecki by Wasosz, Czarniecka Mountain, Modrzewina, Przyłogi, Cisownik, Miedzierza and Sielpia. With the large audience riders fought a fierce battle against four loop around Końskich, located where both the start and finish of the race. 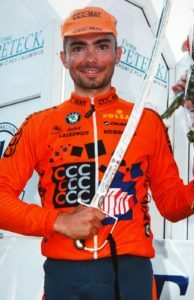 With all the riders the best rates turned out to be a professional player team cycling Mat Ceresit CCC – Cezary Zamana, and he became the first winner of the race. The main cash prize for the winner funded by Hator and the sponsors of the race were also firm: Ceresit and Janlex. 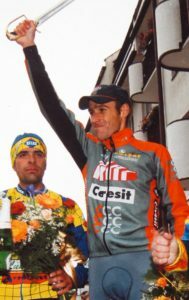 The first edition of the race “Route the fights, Major Hubal” was recognized by the UCI for the best one-day cycling event in the 2000 season.